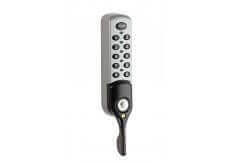 The Lockey digital combination lock 3782 is an Electronic Push button cam lock. This innovative product can be programmed for dedicated private mode or public mode and is suitable for a wide range of applications including leisure centre lockers, medical carts, individuals’ cupboards, key cabinets etc. Use in offices / schools / warehouses / hospitals / care homes / nurseries / hotels / leisure facilities. The ADA/DDA compliant digital combination lock 3782 is an affordable locking solution to the ADA/DDA guidelines on accessibility. With all the standard features you would expect from an electronic lock, plus many others. The 3782 lock is also compatible with the RAS remote allocation system.